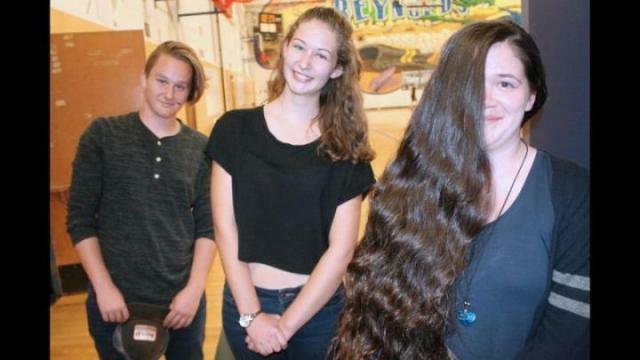 Jacob Renyard, Kaitlin Cranston and Kirsten Crisp will shave their heads on Thursday, Oct. 5, for Reynolds secondary’s annual Cops for Cancer Tour de Rock head shave. Last year Reynolds raised $70,000 and this year the students will pass the $750,000 mark. Sep. 28, 2017 1:30 a.m. When Kaitlin Cranston walked through the Reynolds secondary head shave in 2016 she applauded the brave candidates. Crisp recalled the 2016 Tour de Rock kickoff at Reynolds and a visit from 2011 Reynolds grad Isla Haywood, who was battling cancer. Haywood’s death on July 31, at just 24 years of age, has galvanized Reynolds’ already-mighty fundraising army. Cranston will line up with dozens of students for the Reynolds Tour de Rock head shave on Thursday, Oct. 5. The event packs the Reynolds gymnasium, which hosts a series of makeshift barber stations but offers only one style of cut – the full shave. The head shave has become an institution at Reynolds, though it’s also an iconic rite of passage for the supporters and riders of the Cops for Cancer Tour de Rock, in which first responders ride 1,000 kilometres by bike from Port Alice to Victoria, Sept. 23 to Oct. 6. It’s also the peak of the Reynolds’ fundraising effort. Last year the Saanich high school hit $70,000 and this year it will clear a total of $750,000 raised in 13 years. “It’s bigger than any one person, it’s so many people coming together,” said teacher Chris McDonald, who has adopted Reynolds’ Tour de Rock organizing role from recently retired teacher Dean Norris-Jones. It starts every year with a Tour de Rock kickoff assembly in the gym, followed by a smaller gathering for those who are shaving their heads, or just thinking about it. “There’s a few logistics to it so we run everything past the students to make sure they know what they’re getting into,” said principal Tom Aerts. Thursday is the head shave, and Friday a cheque presentation by the school to the Tour de Rock riders during their brief but loud stop. If there’s one thing that stands out about Reynolds’ Tour de Rock campaign, it’s that the majority of the shaved heads belong to Grade 9 girls. Most of them are aware of the head shave before they even arrive, as the Reynolds phenomenon has reached its middle school feeders. Crisp probably has the most hair of anyone to lose, reaching down to her hips. It will be donated to make wigs for children and adults who’ve lost their hair due to radiation treatment for cancer. If Jacob Renyard’s hair is long enough he’ll donate it too. The Grade 11 student is following his older siblings, Abbie and Nic, who are both Reynolds grads. They were active too, Abbie in organizing Reynolds fundraisers during the 2014 school strike and Nic through community efforts as a hockey player with the Victoria Grizzlies. “I’ve got nine inches right now, I don’t think I’ll have this much by the time grad rolls around next year,” Renyard said.